The Family gets bigger in this brand new expansion for Nothing Personal! Power & Influence adds a whole raft of new gangsters for you to control with new abilities that will turn your game upside down. All new Player Traits affect how you'll approach the game; can you use your strength to get in with the right people at the right time and fight your way to the top? 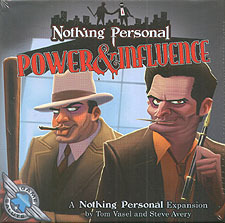 Find out in Nothing Personal: Power & Influence! This is a expansion and requires Nothing Personal to play.